LEGO has always been known for their towns and buildings buildings. Within the last decade, they began creating more complex buildings like the Cafe Corner, the Green Grocer and the Fire Brigade, which were built around a standard that became known as Modulars, and were able to be put together to create more complex towns and cityscapes. 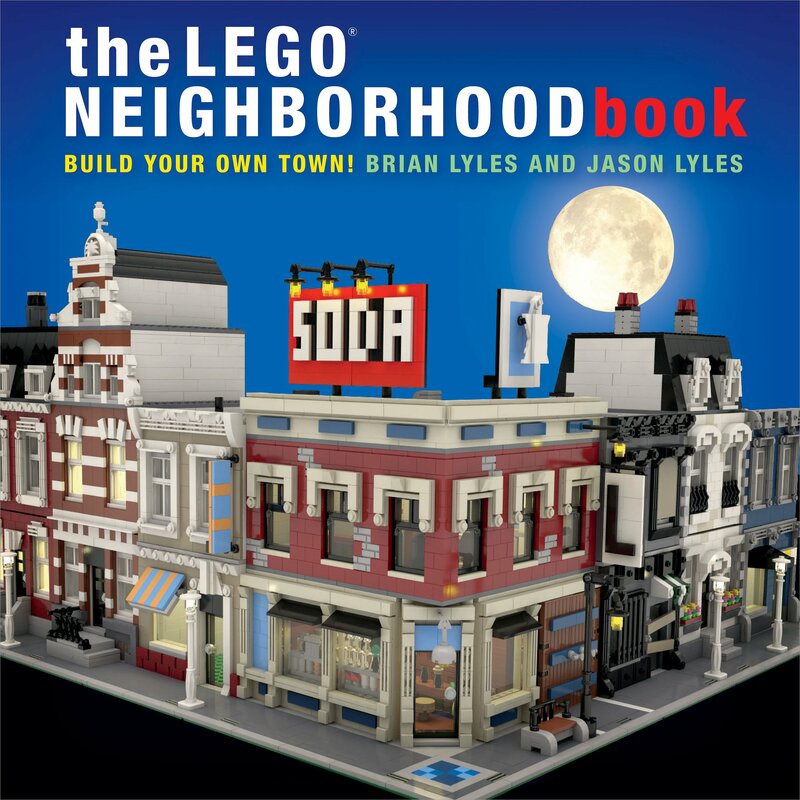 With The LEGO Neighborhood Book by Brian Lyles and Jason Lyles, readers are given an introduction to the standard and instructions to build their own original modulars. The first few chapters take the modular standard from the beginning by giving a history and explaining the modular standard. By starting with a history and the standards basics, the reader starts small and builds up. The details of building and how it compares to actual buildings keeps the building from getting too complex too quickly. From there, the book moves to smaller builds, like furniture and street lamps. Once the basics and the smaller builds are covered, the first buildings the user learns to build are commercial buildings. The Lyles show off some of the stores they have built before showing instructions on how to build a corner drugstore. Utilizing techniques described earlier in the book and furnishing it with the pieces previously shown in the book, a fully realized building is shown that has a real building feel. Following the corner drugstore are three chapters with instructions to build more residential buildings based off the same base with different facades – a parisian apartment, colonial row house, and canal ring house. By showing how the different buildings can be built off the same base, it shows the versatility of how a single building can be used in different ways. The LEGO Neighborhood Book is a great reference for those who want to learn to build buildings in the modular style or add their own creations to go with the modular buildings they have built from LEGO sets. I plan to utilize the ideas to create more buildings to add to the cityscapes that are often displayed by my LUG.